My fourth graders have been reading Sarah, Plain and Tall in their classrooms. They also happened to be studying compare and contrast. I decided I would incorporate the theme of the prairie into a lesson on compare and contrast. Since I had already introduced compare and contrast to my fourth graders, they already had a copy of the anchor chart in their reader's notebooks. We keep the anchor charts in our notebooks, so that we can keep referring to them. 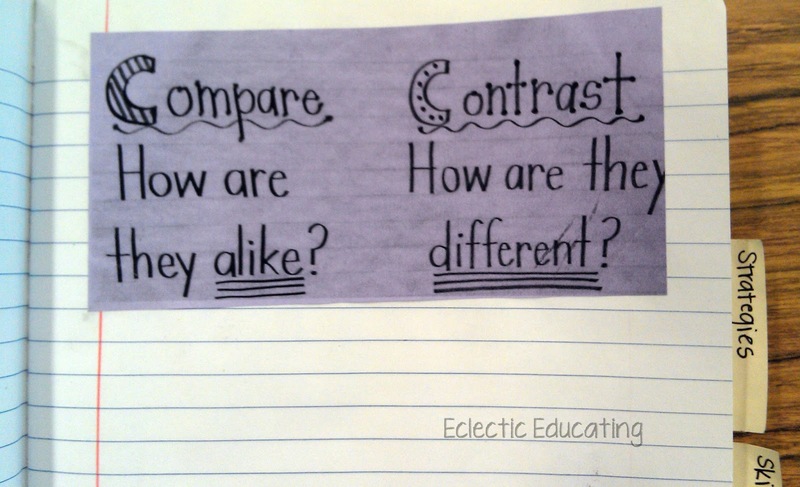 To begin this lesson, we reviewed the anchor chart and what it means to compare and contrast. I find that it is much more meaningful to the students when they look it up for themselves, as opposed to me telling them the answers. 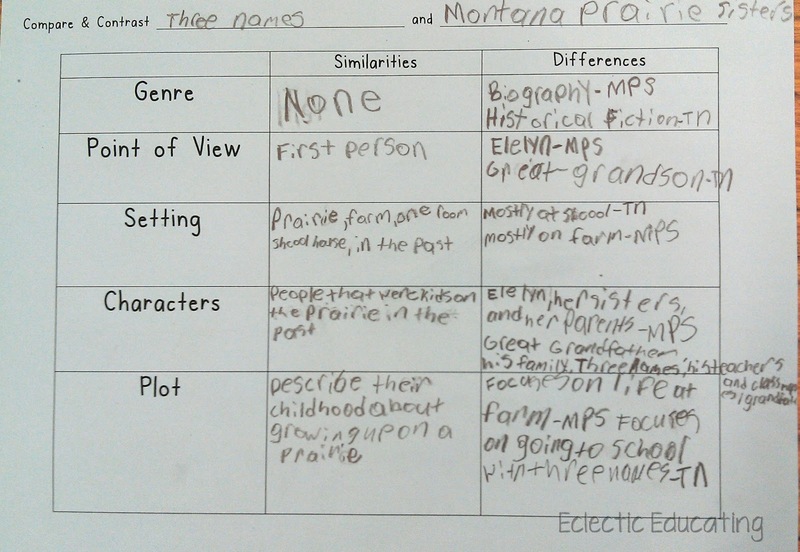 For the second text, I chose a short story called Montana Prairie Sisters. Both of these texts were about children growing up on a prairie and attending school in a one room schoolhouse. One is a fictional story, whereas the other is nonfiction. 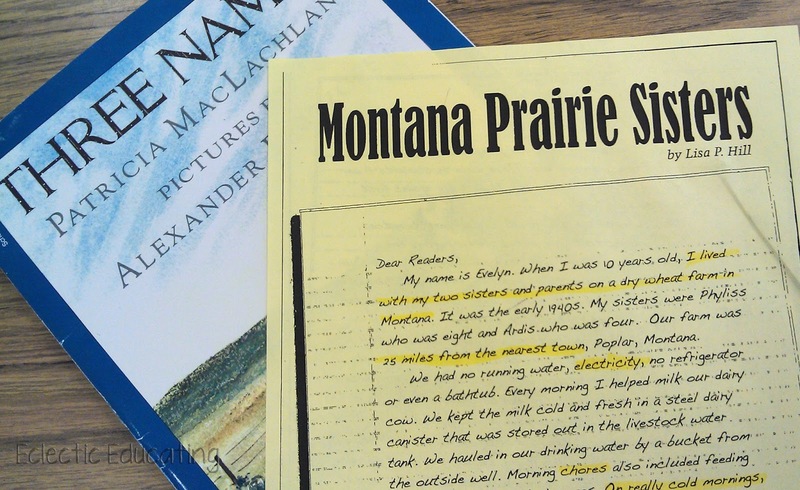 The students read Montana Prairie Sisters independently. As they read, they highlighted the similarities between the two texts. We discussed these similarities together, and students added to their highlighting if necessary. Next, we completed a graphic organizer comparing and contrasting the two texts. (If you would like your own copy of the graphic organizer, click the image above.) The students have a great deal of experience using Venn Diagrams, but I noticed the state tests occasionally use tables for comparing and contrasting. For this reason, I decided to create a table for this graphic organizer. I chose to focus on genre, point of view, setting, characters, and plot. These two texts worked very well for comparing and contrasting. They were very similar, but also quite different. Basically, the fundamentals of the stories were almost identical, the major differences occurred in how the stories were told. I hope you give this different style of graphic organizer a try. Do you use anything besides Venn Diagrams for comparing and contrasting? My teaching partner and I were revising our curriculum for next year today, and one of the things we mentioned revamping was how we teach compare and contrast! I love the idea of using a chart. I also like an H diagram, because it gives students more room to write. I haven't used H diagrams with my class yet - we are still using Venn Diagrams but I really need to make the switch. Are you going to watch the movie with Glenn Close & Christipher Walken?? Great post! 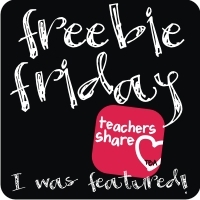 I found your blog through Classroom Freebies and I think I'm your newest follower. Your graphic organizer will be very helpful in synthesizing two different texts. Thank you for the share! This is great! It's much more powerful than just using a blank Venn diagram. This has given me some food for thought as we are working on comparing 2 points of view. Thanks for getting my wheels turning! Love this, I'm always looking for new ideas to use in our reader's notebooks. Thanks for sharing! Great ideas! I love Sarah Plain and Tall. I use a lot of box and t-charts to compare and contrast.